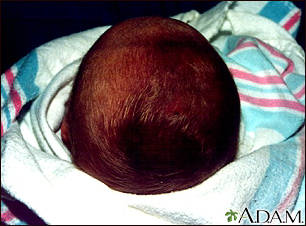 Caput succedaneum is swelling of the scalp in a newborn. It is most often brought on by pressure from the uterus or vaginal wall during a head-first (vertex) delivery. A caput succedaneum is more likely to form during a long or hard delivery. It is more common after the membranes have broken. This is because the fluid in the amniotic sac is no longer providing a cushion for the baby's head. Vacuum extraction done during a difficult birth can also increase the chances of a caput succedaneum. The health care provider will look at the swelling to confirm that it is a caput succedaneum. No other testing is needed. No treatment is needed. The problem most often goes away on its own within a few days. Complete recovery can be expected. The scalp will go back to a normal shape. Complications may include a yellow color to the skin (jaundice) if bruising is involved. Most of the time, the problem is noticed right after birth. You do not need to call your provider unless you have other questions.